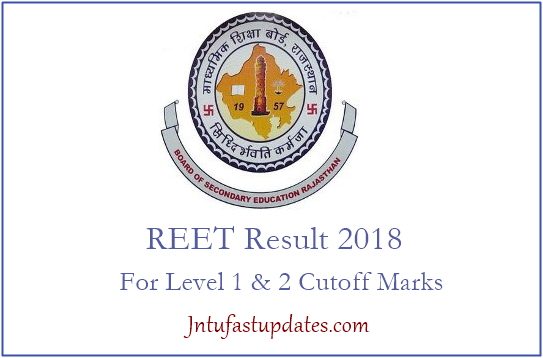 REET Level 2 Results 2018 & Cutoff Marks: Rajasthan Board of Secondary Education (BSER) has completed conducting the Rajasthan Eligibility Examination for Teachers (REET) Examination on 11th February 2018 across the state of Rajasthan. A huge number of aspirants already applied for the REET 2018 have appeared for the test. The examination has been conducted for Paper 1 and Paper 2. Candidates, those have appeared for the examination have checked the answer keys and analyzed their attempt. Candidates those have been waiting for the REET result 2018 can check the result from BSER website, rajeduboard.nic.in. along with the result, aspirants can also check the REET Cutoff marks, merit list at the time of results. Check more details from here below. REET Result 2018 Level 2 : Rajasthan Board of Secondary Education (BSER) has recently issued the official notification for 35,000 3rd Grade Teachers. Past a few months back the officials of the organization have released a notification in order to fill up the Teacher vacancies for the classes 1 to 5 and the standard 6th to 8th. A huge number of aspirants wishing to become primary and secondary grade school teachers have applied for the REET (Rajasthan Eligibility Examination for Teachers). The REET Examination Level 1 – 1st to 5th class – was attempted for aspirants seeking to become primary grade teacher and REET Level 2 for 6th to 8th Class – was attempted by the aspirants who wish to become secondary grade teachers in the state of Rajasthan. The selection of aspirants will be done by the merit obtained by the aspirants. Candidates have to obtain the minimum cutoff marks to clear the examination. The REET Cutoff marks will be announced by the BSER at the time of result announcement. Candidates can check the BSER REET last year cutoff marks for a reference until the board releases the cutoff marks for this year. The BSER is going to release the REET Merit list of examination cleared candidates. Aspirants those have appeared for the REET examination can check the official website, rajeduboard.nic.in for cutoff marks and merit list information. Note: Due to Heavy number of users, Website opening slowly. SO People should reload this page and try again. Rajasthan Education Board will be announced official REET Level 2 Cutoff Marks 2018 in the Official website. We have uploaded Below images from the portal. People can check Category wise cutoff for General, OBC, MBC, SC, ST, Sahariya and also for special categories given below. 1.2 How To Check BSER REET Level 2 Result 2018 online? Sir mera roll no. 106107033 h.or DOB 01/12/1985 h.invalid Bata Raha h .plz result bataeiye.